Phoenix Raceway is a unique venue for NASCAR, one that is only going to become more unusual once ongoing renovations are complete. Honestly, for the kind of money ISC is spending, I wish they came up with a setup where every seat had a cover over it. With the sport traveling to Homestead-Miami Speedway this weekend, Hard Rock Stadium in nearby Miami Gardens comes to mind. Regardless, the participants in each series’ Championship 4 were decided this past weekend in three very different races. We’ll cover the insanity that was Friday night’s Lucas Oil 150 for NASCAR’s Camping World Truck Series later this week. Today, we’re going to focus on Sunday’s Can-Am 500k and Saturday’s Ticket Galaxy 200. 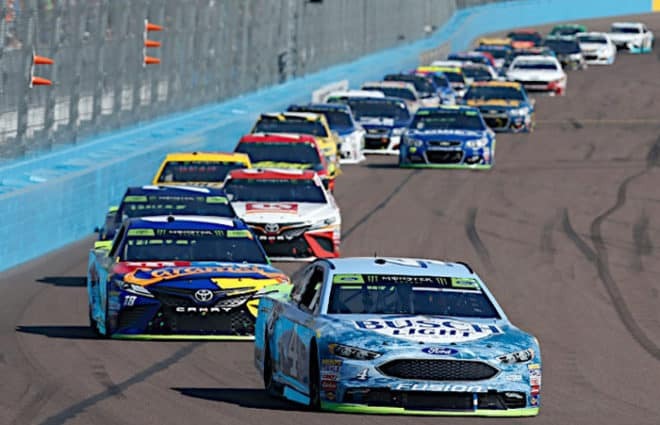 Sunday afternoon brought the Monster Energy NASCAR Cup Series back to Phoenix for their 30th fall race in Arizona. 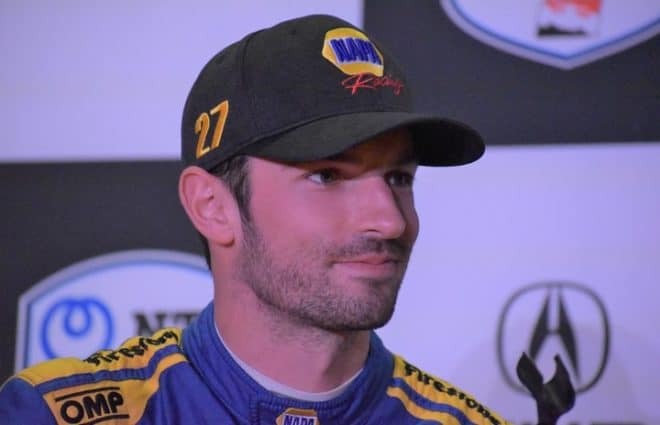 Throughout Sunday’s event, there were a number of references to the Chase Elliott–Denny Hamlin spat in Martinsville. While yes, contact between the two drivers was ultimately important later on, the constant hyping of the situation was rather unnecessary. It was annoying to hear on lap 30, long before the duo came together on-track. It appears as if NBC is trying to build up a rivalry between the two drivers. Of note, these two men are managed by the same agents. 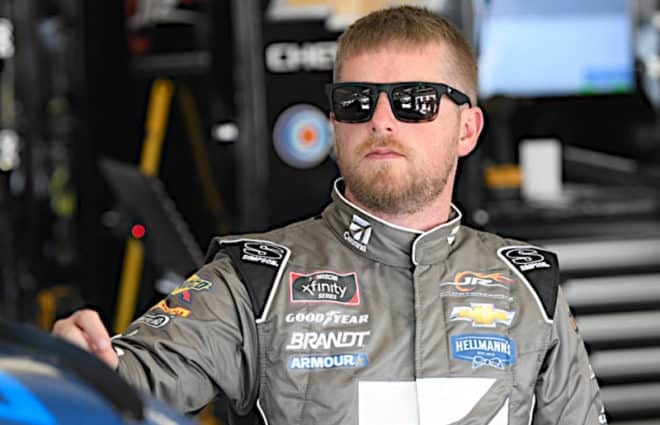 While it’s quite obvious that Elliott and Hamlin are not on the same team, their representation might not like the idea of two clients in conflict with each other. The Elliott-Hamlin contact, covered well, has remained the top story of this week. NBC made sure to ask the right questions to both drivers about what happened on the track, Elliott’s mentality after Martinsville, and Hamlin’s view on the contact. But is there really a rivalry here going forward? At the moment, probably not, although it might be inching towards that point. There’s obviously some people out there that want it to be one. A quick perusal of Twitter indicates fans are still fired up over the whole mess at Martinsville. In addition, Hamlin’s not happy over what happened Sunday. He fired off on the media Monday evening as this column was being written. Of course, the Hamlin-Elliott incident had the biggest impact to the NASCAR playoff’s Championship 4. 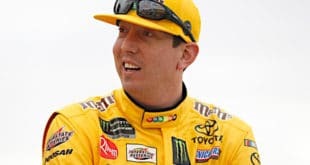 With three drivers (Kyle Busch, Kevin Harvick, and Martin Truex Jr.) already locked in entering the race, there was less focus on the title than there could have been. Having said that, there was still plenty. Most of the pre-race coverage was almost completely focused on the points. We got interviews with the potential final candidates and really not much about the race itself. The only exception to that rule was a feature about Brad Keselowski’s Checkered Flag Foundation, which benefits veterans. 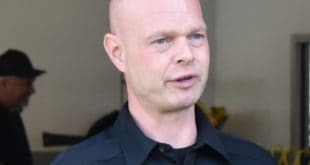 It is an issue that is very important to Keselowski and has been since before he started in NASCAR (he wanted to serve in the armed forces at one point). 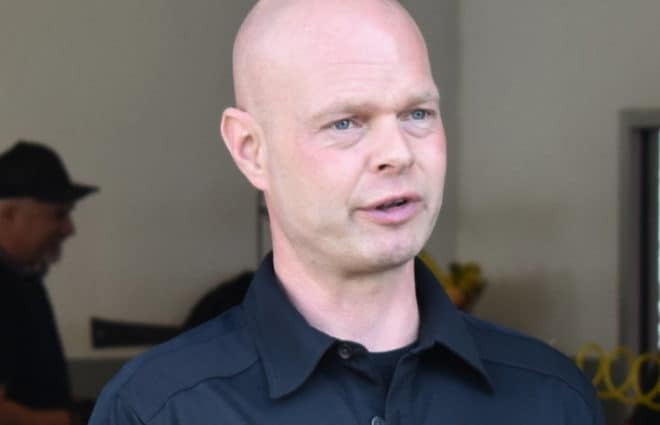 Viewers learned the story of Dale Beatty, a retired Staff Sergeant in the United States Army who lost his legs due to an anti-tank land mine in Iraq. His family stayed at Fisher House during Beatty’s treatment, a place where families of injured veterans can stay rent-free during the process. There are currently 72 of them scattered about the country. Here in New York, there is only one for the whole state located in Albany (two more are currently under construction in the Bronx). Many of the houses are located close to VA Hospitals. The piece definitely shows that Keselowski is sincere about his desire to help veterans. He’s more than willing to put the money where his mouth is. Just last weekend, the Checkered Flag Foundation donated $150,000 to Fisher House. Back to the topic of playoff overload. It’s frustrating at times. Yes, the postseason has importance, but these days, the race doesn’t seem to matter. That’s a problem. The 51,000 people that went to Phoenix Sunday for the main event weren’t necessarily there just to see who would join the aforementioned trio at Homestead. They were there under the sunny skies to check out some good racing. The competition was great, a factor of the Phoenix asphalt settling in and that should be the central focus. The playoffs should still play a role in the broadcast; it just can’t be the main attraction 24/7. The action at Phoenix throughout the day gave NBC a chance to show good racing. The groove widened substantially to the largest extent since the track was reconfigured, making Sunday a legitimately exciting race to watch. Phoenix was always a relatively tough place to pass even before the current setup. Now, fans will likely see side-by-side racing for years to come. The renovations will make it that much more comfortable (if you’re not on Rattlesnake Hill). There were a number of tire issues both on Saturday and Sunday, but there wasn’t all that much discussion of those concerns. It seemed like NBC just assumed the failures would be from either contact or melted beads. We never really got a real idea of what tire wear was like. Sometimes, two tires could be used; other times, not so much. Some specific analysis from pit road would have helped out a bunch. Remember, this race had two 75-lap runs to start off. But the second was ended by Jimmie Johnson’s blown tire (and resulting crash); we never really saw a full set of green-flag pit stops. The coverage of Chris Buescher’s wreck was rather confusing to watch at first. A second look was required. At first, it seemed like everyone screwed up. However, Steve Letarte correctly identified brake failure on Buescher’s No. 37 after Rick Allen and Jeff Burton were initially convinced it was a blown tire. During a commercial break on the crash, two things happened. One, a second fire broke out in between the SAFER Barrier and the concrete wall. Two, the commentators watched the replays in slow motion and were able to detect the brake rotor exploding on Buescher’s car. As for the fires, they appeared to be caused by hot rotors sparking. That could be as simple as the pieces hitting the pavement behind the SAFER Barrier. Oh btw, sorry @PhoenixRaceway for trying to burn your race track down. Post-race coverage was about what we’ve seen for the past few weeks. Yes, Matt Kenseth got the same winners’ coverage that everyone else gets despite not being a playoff contender. That was refreshing to see, although necessary due to his impending hiatus from the sport. Besides Kenseth’s victory, the playoff contenders still got the lion’s share of the on-camera time. I still think that it should be more equitable, especially with drivers like even Dale Earnhardt Jr. pulling surprising top-10 finishes late. Overall, Sunday was a decent broadcast. It was definitely rough at times, but viewers got some good on-track action. The current version of Phoenix International Raceway definitely aided in that transition. The ongoing overhyping of the Elliott-Hamlin spat continues to be annoying, though. 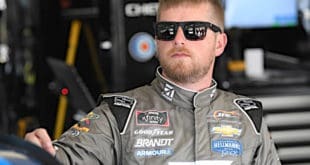 Saturday afternoon saw NASCAR’s XFINITY Series take on Phoenix International Raceway for 200 miles of action. Like many of the recent races, Cup regulars dominated. However, William Byron broke up that party through the use of pit strategy. Points-wise, the XFINITY playoffs were the most wide-open of the lot, but that’s mainly because drivers like Erik Jones come in and “whack” the races. No one was locked into the Championship 4 entering Saturday. As a result, NBCSN should have been in position to cover the race a little more broadly. Ultimately, that’s what viewers actually got. Having said that, there were a couple of instances which stood out on Saturday. One was when Brennan Poole crashed out of the race early on. If you’re reading this column, you probably know what happened. We’ll throw up a video to refresh your memories. 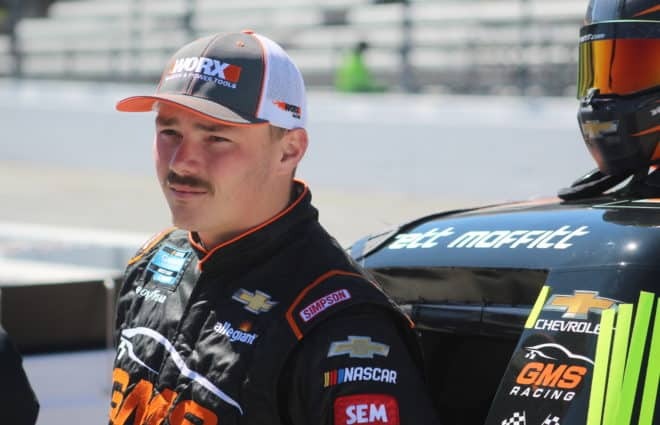 Poole was simply trying to keep pace with Cole Custer when they came upon the lapped car of Caesar Bacarella, who was making his XFINITY Series debut. Unfortunately, this wreck was simply an instance of Bacarella failing to hold his line. Those particular words weren’t exactly stated on the broadcast, but they were insinuated. Also, Allen appeared to butcher Bacarella’s last name, then did not use it for the rest of the day. NBCSN did a good job detailing the damage on Poole’s No. 48. This incident would have been a great place to use their on-screen five-minute clock, but alas, it did not come out to play here. The secondary crash under yellow was caught live and explained well, though. Of course, the lunacy that is the Damaged Vehicle Policy is a discussion for another time. Another notable moment for NBC came towards the end of the race. From the final restart, NBC knew that the final championship spot was going to come down to Custer and Daniel Hemric. Effectively, all you saw over the final 13 laps were these two guys duking it out. Whomever else was in and around the battle (Christopher Bell, Blake Koch) got some time as well. Anyone who’s read this column over the past nine seasons knows that hyper focus doesn’t really work. Even if someone were to pull off a pretty amazing move, it is solely within the context of this battle. Bell’s three-wide pass coming to the white flag is a perfect example. That dude went three-wide on the outside of turns 3 and 4 and made that work. Quite simply, that is a move which doesn’t happen every day. Meanwhile, Byron’s out there leading and we get nothing on him, or anyone else other than Custer and Hemric. At least they gave viewers a good battle since you couldn’t see anything else. Post-race coverage was decent, for the most part. Viewers got half-a-dozen driver interviews and championship hype prior to the local news. Also of note, there was a crash involving Brandon Jones right after the finish.
.@BrandonJonesRac has been evaluated and released from the care center after last-lap contact with the 16. That incident sums up Jones’ 2017 season but it was not even referenced on the broadcast. I only found out it happened because of pictures posted on Twitter Sunday morning. That’s unacceptable for NBC, no matter the circumstances. That’s all for this week. Next weekend, four different series will crown champions. Naturally, you have Ford Championship Weekend at Homestead-Miami Speedway. You know what’s going on down there. In addition, the FIA World Endurance Championship comes to a close at the Bahrain International Circuit on Saturday. Also of note, NBC has a split setup for Sunday. The regular broadcast will air on NBC while the Hot Pass broadcast will return to NBCSN with Leigh Diffey and Dale Jarrett commentating. We will bring you critiques of the Cup and XFINITY broadcasts at minimum for next week’s edition of Couch Potato Tuesday at Frontstretch. It will be the last full-sized critique of the season. Be sure to read the Critic’s Annex in our Frontstretch Newsletter for a critique of the Lucas Oil 150 later this week. Previous STP Returning to Richard Petty Motorsports in 2018 With Darrell Wallace Jr.
NBC’s coverage of IndyCar and Formula One is really good but their coverage of NASCAR is awful. If Rick Allen couldn’t repeat what everyone else says, he have nothing to say. Rutledge Wood’s cut-away features are cute but don’t belong during the race. Do them in the pre-show. These are the play-offs. Stop treating the viewers as if they’ve never watched a race before. For weeks, I’ve been muting NBC sound and listening to the radio. Can’t wait for Mike Joy and Daytona. You can’t have noticed that for the first time. Are you ready for 36 cars, drivers and sponsors to disappear? Can you guess how many laps until the top 4 cars are the farcical four? imho the farce is having a “playoff” and allowing teams that are not part of the “playoff” to compete. Yes I understand the economic reason behind that decision, even so, either have a playoff or don’t I’m fine either way. I agree, but can you imagine how boring it would be to watch 4 cars run 400 miles? That would be hilarious and I doubt if anyone would want to watch it. But that’s what makes the chase so stupid and a bad joke…. all those other cars out there affecting the outcome of those running for a championship. 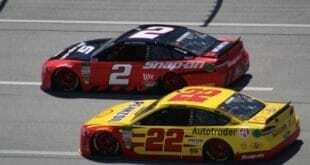 What back marker driver 5+ laps down will have an issue late in the race that results in a caution, which will breed more cautions, and cause the one race, crapshoot, championship to be decided in the mayhem that ensues with multiple restarts, this year? I’m sticking with the 23 or 32. But in the last few events the 51 and 95 have been the spinners scratching the itch on their arms or reaching for their Harvey Wallbangers. It would be interesting to compare coverage of a late season race from 15-20 years ago (whether the championship was still in play or not) to what we see today. When we hear about the “economics” of the sport pushing sponsors and/or drivers out, the proof is in the pudding. Year after year, non Chase/Playoff drivers finish late season races in the Top 5 or Top 10 yet you wouldn’t know they were even on the track. Sponsors have figured this out. Why put your name on a car if the only air time you get is if the car spins out or gets into the wall? I hearken back to the day Johnny Benson won his only Cup race at Rockingham. If memory serves right, that was the main story out of the race, even though Tony Stewart and Mark Martin had a rather close championship battle going on. The lack of coverage of the entire field has made me hate this playoff crapshoot even more. It’s All playoff all the time. Pathetic.